Small ship, South Pacific luxury cruise line specializes in romance. Brides magazine has named Paul Gauguin Cruises '#1 for Honeymooners'. The cruise line operates the longest continually sailing luxury cruise ship in the South Pacific. The 'Paul Gauguin' is a 5+ star, 332-guest idyllic ship that sails to some of the most exotically romantic locations on any honeymoon couples' list: Tahiti, Fiji, French Polynesia, and other once-in-a-lifetime destinations in the South Pacific. Honeymooners receive a complimentary honeymoon package when sailing with Paul Gauguin Cruises, which includes a special Polynesian blessing ceremony aboard the ship performed by Les Gauguines and Les Gauguins and hosted by the Cruise Director, an in-stateroom celebratory bottle of Champagne, one 8" x 10" photo portrait, and an exclusive pillow gift. Why wait for the honeymoon? Would you love an unforgettable vow renewal? Or a cruise wedding? 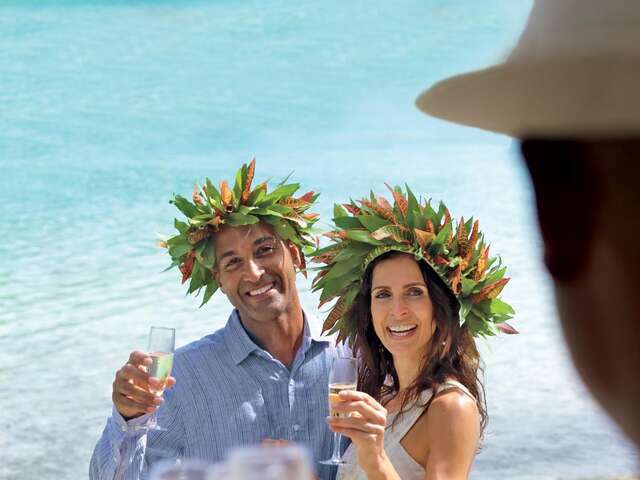 For those celebrating a romantic special occasion, Paul Gauguin Cruises also now offers wedding ceremony and renewal of vows packages in a dreamy setting amid the turquoise lagoons and exotic islands of French Polynesia at Motu Mahana, the cruise line's private islet off the coast of Taha'a, or at the InterContinental Bora Bora Resort & Thalasso Spa, with tasteful, romantic, and inspiring touches of local French Polynesian culture that ensure a one-of-a-kind ceremony. The 'Number 1 for Honeymooners' distinction is another in a long list for Paul Gauguin Cruises; other awards for the cruise line include: voted #2 in the category of "Top Small Cruise Lines" in the Condé Nast Traveler 2016 Readers' Choice Awards and recognition on the publication's 2016 "Gold List." In addition, the line was voted by Travel + Leisure readers "#1 Small-Ship Cruise Line" and "#1 Small-Ship Cruise Line for Families" in the Travel + Leisure 2014 World's Best Awards. Recently, readers voted Paul Gauguin Cruises "#1 Midsize-Ship Ocean Cruise Line" in the Travel + Leisure World's Best Awards 2016.